Mario Gonzalez, Homes for Heroes real estate specialist in Jacksonville, Florida and the VAREP Jacksonville Chapter began putting together their plan for giving back over the 2018 holiday season, and they were presented an opportunity to assist a local hero family in need. Local Buzz TV host, Steve Strum, hosts “5 Minutes With” with Homes for Heroes real estate specialist, Mario Gonzalez. Jeremy McKay is a U.S. Marine Corps veteran and a 13-year, Clay County firefighter. Jeremy and his wife, Tanya, are raising four children: three daughters (ages 17, 11, 4) and an 18-year old boy. In September 2018, Jeremy was diagnosed with terminal stage 4 stomach cancer that has since then moved to other organs. His wife Tanya is unable to work full time as she is the primary caregiver for Jeremy and their 4 children. Through funds raised by the VAREP Jacksonville Chapter and the help of a local company, AC Systems of Jacksonville, the McKay family was able to replace their home’s entire AC system including a new AC, trunk and ducts to help keep Jeremy comfortable. 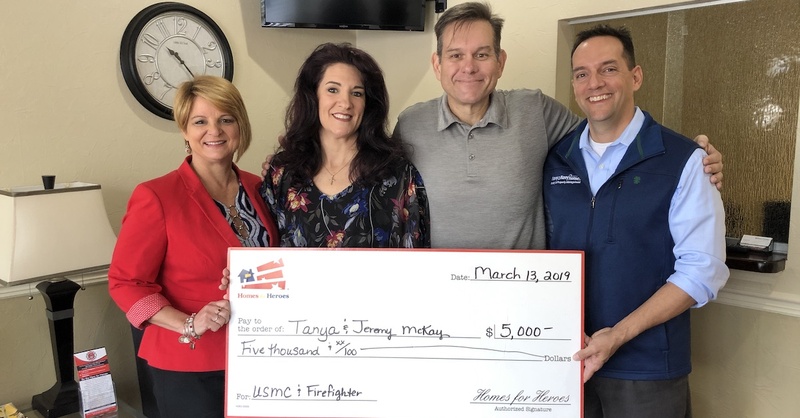 Through the VAREP Jacksonville Chapter, the Homes for Heroes Foundation was able to award a $5,000 hero grant to the McKay family, represented by Homes for Heroes affiliate real estate specialists, Mario Gonzalez and Susan Severson. These funds will be used to help the McKay family with any work that needs to be done on their home, or to address any financial emergency situations they may face. “It has been a pleasure and an honor getting to know the McKay family. I wasn’t expecting Jeremy to show up for the check presentation photo, but he was between weeks with chemotherapy and wanted to say thanks in person. He has such an amazing spirit,” said Mario Gonzalez, Homes for Heroes real estate specialist and VAREP Jacksonville Chapter President. Jeremy and his wife Tanya have dedicated their lives to help prevent other firefighters from experiencing the same circumstances as Jeremy by improving the safety gear for firefighters. As it turns out, the cancer statistics for firefighters are nothing short of staggering. Research shows when firefighter body temperatures are raised (in a fire) their skin actually absorbs toxins through the air at an accelerated rate. The VAREP mission is to increase sustainable homeownership, financial-literacy education, VA loan awareness, and economic opportunity for the active-military and veterans nationally and through local community chapters. Each VAREP chapter also oversees a VAREP Cares program that gives back to the Veteran community every year, through service and or financial assistance to their local veterans in need. The VAREP Jacksonville Chapter accepts online donations and would be honored to receive your support. The Homes for Heroes Foundation works with national and local nonprofits who assist American heroes; firefighters, EMS, law enforcement, military (active, reserves and veterans), healthcare professionals and teachers who are in need of housing or emergency financial assistance. Please donate today to assist our American heroes.